As celebrities like Meghan Markle, Lady Gaga, & Anne Hathaway can illustrate, showing off personality with piercings is more popular than ever before. While this is a great way for anyone to add a bit of edge to their look, with beautiful earrings comes great responsibility. Before you can start thinking about swapping out earrings and having a variety of styles to choose from, a new piercing requires aftercare. Follow along to learn more! First, let’s talk about the basics of Ear Piercing Aftercare. Always wash your hands before touching your ears or piercing earrings. During the healing period, keep your piercing dry and clean. Do not remove your earrings during the recommended healing period (6 weeks for an earlobe piercing and 12 weeks for a cartilage piercing). Cleanse the front and back of the pierced area at least three times daily using a clean cotton swab soaked with Inverness Aftercare Solution. Three times daily while cleansing, rotate the earrings completely to prevent the earring from adhering to the ear. Note: you will also want to clean your piercing after exercise, swimming, or any exposure to perfumes or hair products. 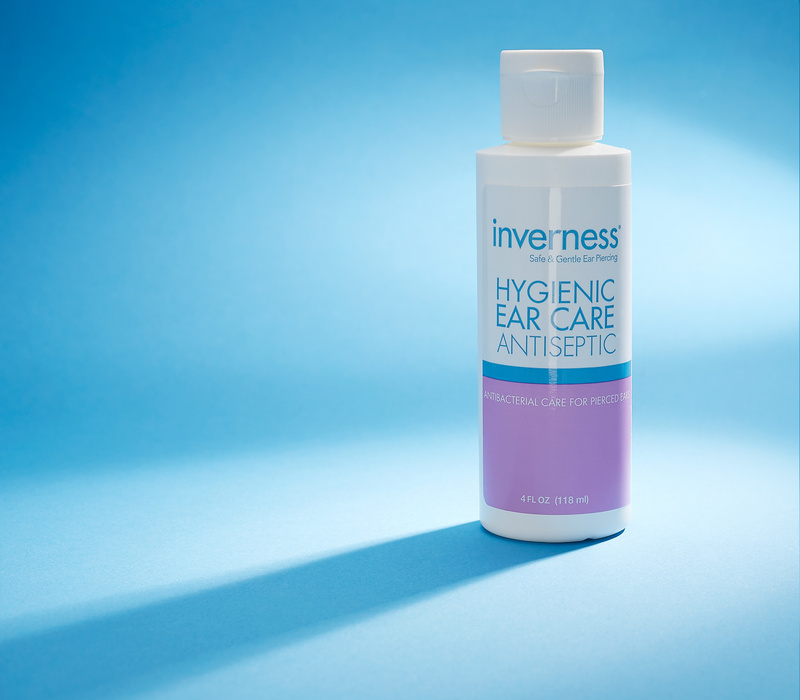 Inverness Ear Care Solution is specially-formulated to keep your new piercing clean and comfortable during the aftercare healing period. Our ear care solution contains only purified water and Benzalkonium Chloride, an antiseptic that cleans and soothes a new piercing. We recommend using this solution at least three times daily during the initial healing period (6 weeks for an earlobe piercing and 12 weeks for a cartilage piercing). After the healing period has ended, we recommend that you continue using your ear care solution as needed to keep your new piercing and earrings clean. Still have questions about our ear care solution or aftercare? Contact us directly to learn more.